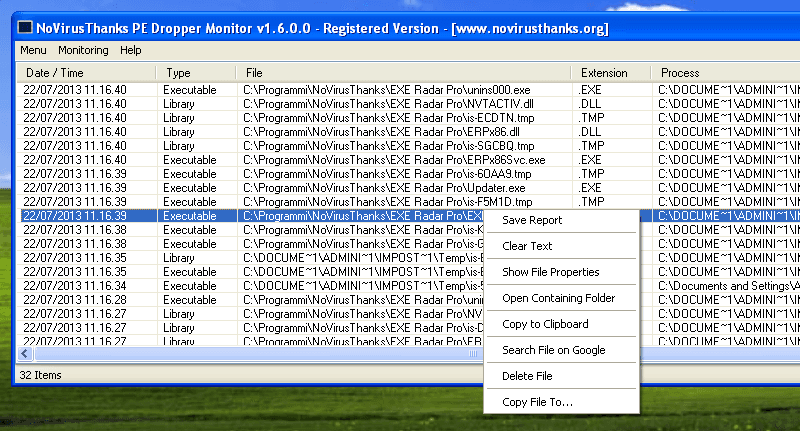 PE Dropper Monitor is a useful Windows OS utility designed to monitor and log files of executable nature (PE files) which are “dropped” onto the hard disk. When a PE file is dropped in the system, the application logs the following details: date/time, the process filename which is responsible for dropping the PE file, the filename of the dropped file and the type of dropped file (EXE, SYS, DLL etc). This tool tracks all executable files dropped onto the hard disk. PE files are detected by validating the PE structure of the file dropped in the system and not by simply checking the file extension. This assures a better result in detecting real PE files of type library (DLL), executable (EXE) and driver (SYS). The program hooks some Windows APIs in user-mode to catch the files created in the system. Monitor all PE files (EXE, DLL, SYS) dropped onto the hard disk. Validate the PE structure of the file dropped in the system. View detailed information about every PE file dropped in the system. Show the type of the PE file, i.e library (DLL), executable (EXE) or driver (SYS).